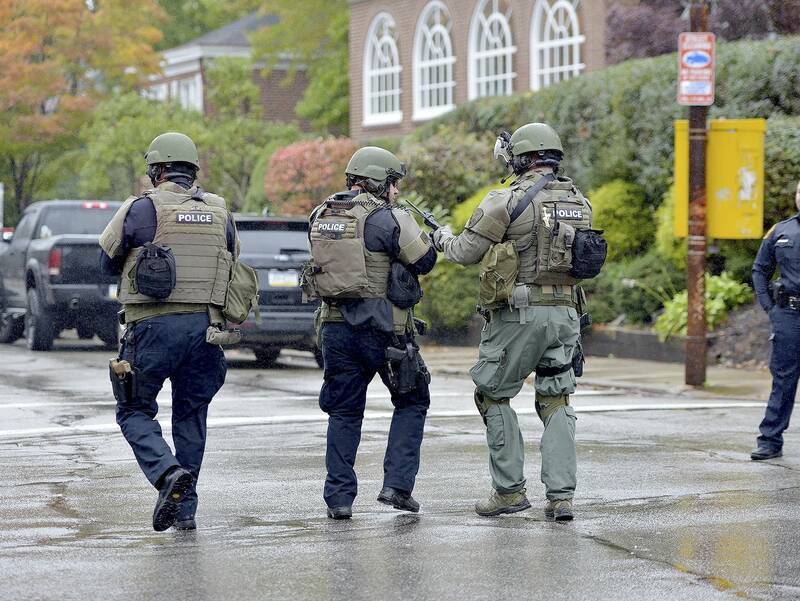 (71 Republic) – Officials confirmed that 11 died on Saturday in the United States after a gunman entered a Pittsburgh synagogue and opened fire, with six others injured before the suspect was brought into custody by police. The suspect, who reportedly yelled “all Jews must die” as he shot into worshippers, was identified by authorities as a white male with a beard, who surrendered to authorities wounded and crawling on his knees after a shootout with police. The suspect has social media filled with anti-Jewish sentiment, and posted on a website called Gab apparently warning of his attack on the synagogue. Police reached the Tree of Life Congregation Synagogue at around 10 a.m. ET during Saturday morning services, and a resulting probe has revealed that four officers and two citizens were injured. U.S. President Donald Trump spoke to the press just before 1 p.m., saying that the results of the shooting are “far more devastating than anyone originally thought”, and vouched for the use of the death penalty for those that shoot up churches and temples. Trump told the press that the result could have been “far better” if there was an armed guard inside the synagogue, and did not dispute supporting armed security for “churches and temples” nationwide, before boarding Air Force One for a farmers’ conference. The president also praised police and said the federal government was standing by to assist the state and the city, telling reporters to expect a fuller statement later in the day at the Future Farmers of America conference. Trump originally tweeted that he is “watching the events in Pittsburgh, Pennsylvania”, telling those in the predominately Jewish area known as Squirrel Hill to “remain sheltered” and to “beware of active shooter”. Wendell Hissrich, the Pittsburgh public safety director, told reporters early Saturday afternoon that the area lockdown was lifted and that the Federal Bureau of Investigation would be leading the probe into the mass shooting. The attack was described by the Anti-Defamation League as “likely the deadliest attack on the Jewish community in the history of the United States”. The New York Police Department said later that police have been deployed at synagogues across the city. Through the use of Call of Duty and other violent video games, the United States armed forces is trying to desensitize its soldiers to killing. Did Hungary Really Just Ban Gender Studies? A Fox News story gave a blatantly inaccurate headline regarding Hungary's new policy towards gender studies programs.